One of the rescued bears at Ghotki in January 2015. 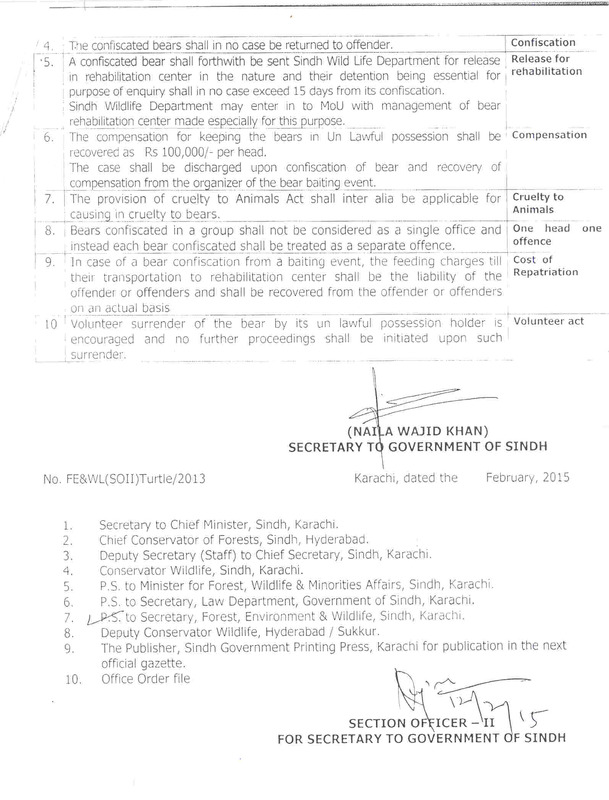 In January 2015, following the January 5 raid on the bear baiting event in Ghotki, AMINALS brought to the attention of the Sindh Wildlife Department that Sindh Wildlife Protection Ordinance, 1972 only applied to Game Animals and Protected Animals as defined in it and as listed in the two schedules to the Ordinance. Unfortunately, bears were not included in this listing. The Sindh Wildlife officials kindly responded to the request but the steps taken by the Department are legally not tangible. In February, the Department issued a notification under section 40(i) of the Ordinance covering the above two categories of bears but also mentioned a few rules therein. Firstly, there is no sub-clause to section 40; and section 40 of the Ordinance does not empower the Government to enact rules. The brief rules made it illegal to keep and use bears for baiting, dancing, begging, or in circuses. 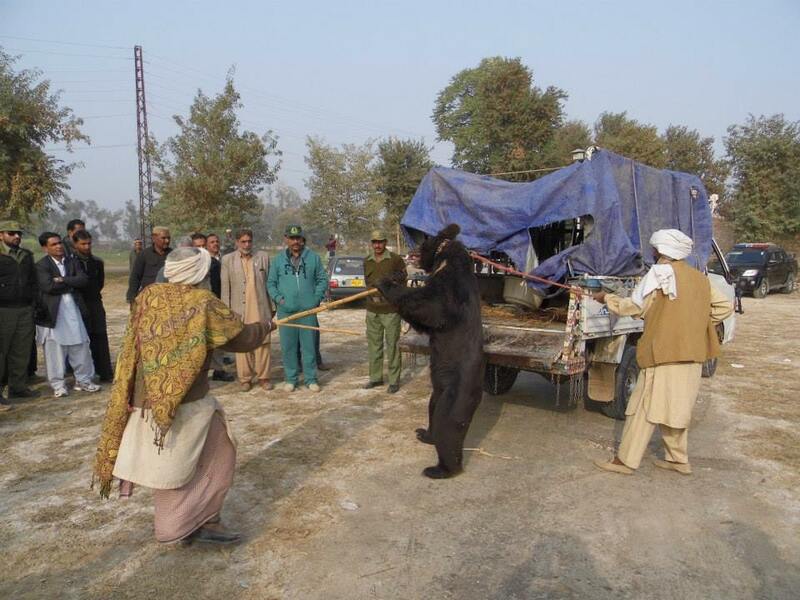 The notification was a welcoming development and a major step forward in protecting bears in Pakistan. However, in its current state, the notification is legally not defensible and tenable and unlikely to be upheld in a court of law. AMINALS pointed this flaw to the Department; another notification was issued but it continues to repeat the above mistakes with a few modifications. Another notification needs to be issued under Section 41 on the following lines inserting the relevant provisions in the Wildlife Rules. 21. The bear baiting, bear fighting, bear dancing, forced begging and keeping them in circus shall be prohibited under the Ordinance and the Rules. 22. The Sindh Wildlife Department shall be empowered to issue a Certificate of Lawful possession upon a request from an educational and research institute. 23. The bears found in unlawful possession of any person shall be liable to confiscation; and proceedings against the offender can be initiated under the relevant provisions of the Ordinance the Rules. The confiscated bears in no event shall be returned to the offender. 24. The feeding charges, and the transportation costs to a rehabilitation center, of a confiscated bear, shall be the liability of the offender, and shall be recovered from the offender. 25. A confiscated bear shall be sent to Sindh Wildlife Department, which shall hand it over to a proper rehabilitation center. 26. Any volunteer surrender of a bear by its unlawful possession holder shall not be liable to any proceedings against the offender. 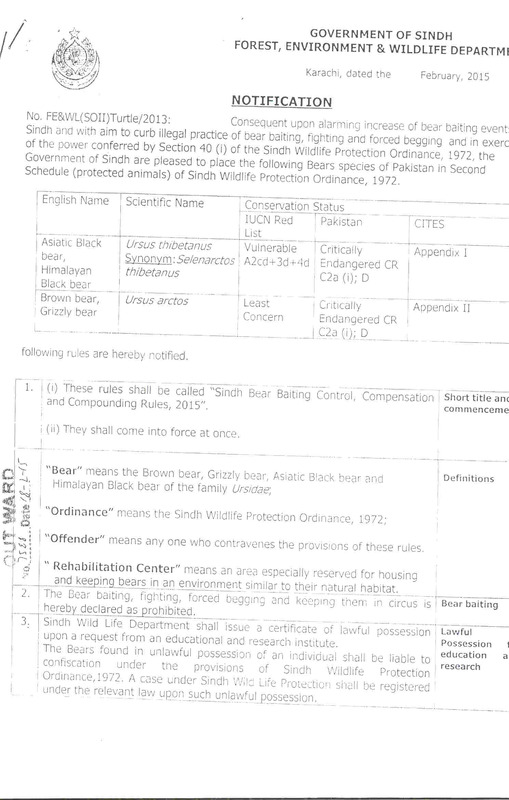 It is hoped that the Sindh Wildlife Department officials will need the needful to promote and protect bears in the Province.